We use HTML almost for everything, it’s simple text with extra attributes like bold, italic etc. This attributes (tags) are parsed by browser in order to display the text. Writing HTML is not easy always especially if you are writing a book, docs or a long blog post. You have to remember the tags. Add <p> tag to every paragraph. The Markdown makes it easy to generate HTML formatted text. It replaces simple formatting characters with HTML tags. For example text surrounded with ** becomes bold, text surrounded with ` gets enclosed by ‘code’ tag. Instead of writing the direct answer, I will tell you when I came across Markdown first time. Back in 2013, while commenting on issues on GitHub I saw one short note, Markdown is supported. Clicking on that note took me to the small cheat sheet of Markdown styling. I thought that is something nice, I will need it some day. Similar note is still there on GitHub which takes you to the Mastering Markdown page (Impressive). GitHub’s online editor provides preview as well. 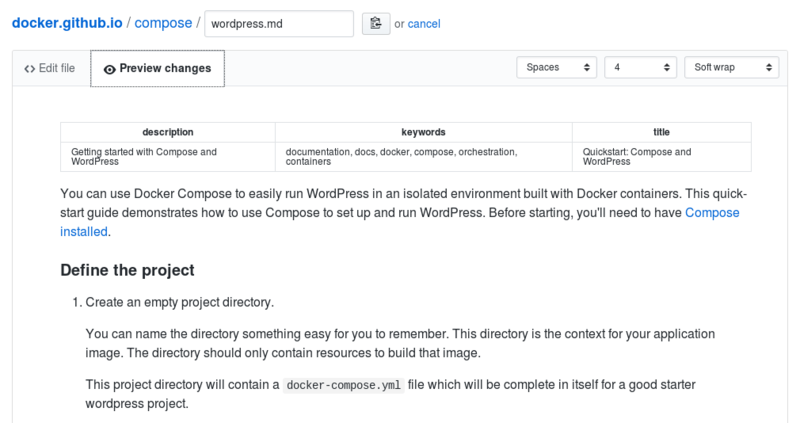 Here is the preview of one file from Docker Docs. You can use this online tool to write Markdown and convert it to HTML.